This video is rather old, and I actually think I’ve posted it here before, but when Chris Spealler (owner of CrossFit Park City) is involved, you can never post a video too many times. After last week’s Molly Metz Double-Under extravaganza, some of you may have thought, “Tom…. 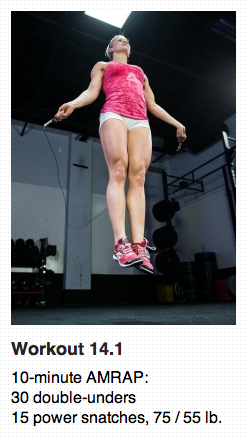 Molly jumps rope for a living. Of course she can do double-unders without messing up for 10 minutes in a row.” Now, I know none of you DID think that, but you could have. Chris Spealler, however, does a lot more than double-unders for a living. In fact, what DOESN’T Chris Spealler do? So, here you have it… 251 consecutive double-unders. Oh, sorry…. in 2 minutes. Sometimes I feel like posting really cool CrossFit accomplishments I see “out there”, and so far I have been using my “Moment of Awesomeness” segment for those. I think something more appropriate would be to start a NEW SEGMENT called “CrossFit Rock Stars“!! Today’s video comes from the crew at CrossFit 515, and features their athlete Bobby Noyce. Now you may have seen Robby featured in such YouTube films as “CrossFit 515 – Bobby Butterfly Muscle Ups“, but this next one is even more impressive to me! He completes over 500 Double-Unders IN A ROW!! Juli Bauer and Jon Moffitt… time to step up your fresh, friends! p.s.- Thanks for my friends at Alpine CrossFit for sharing this video! Sunday Funday’s workout this week was a little different. Usually during our workouts the movements are completely varied in terms of how they go, let’s say with one “pushing” movement and one “pulling” movement. Today I wanted to change that up. We performed both Wall Ball Tosses AND Thrusters. On paper, these movements are very similar (start at the shoulders, stand up aggressively and throw your arms into the sky), but in practice, I wanted the athletes to feel how different it was to throw a round/irregular-shaped object in the air and then need to catch it, versus keeping an evenly balanced barbell safely in your hands. The crew did a great job today!